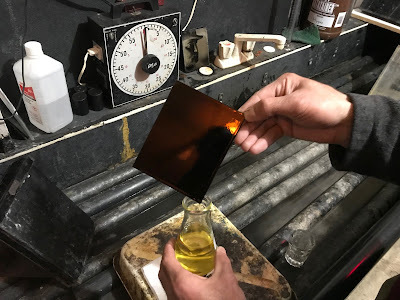 Last night, for the first time ever in my experience with wet plate photography, I mixed up collodion from scratch and so thought I'd write about how it went. First off - plain USP (U.S. Pharmacopeia) Collodion is a mixture of ether, alcohol and nitrocellulose (also known as nitrated or gun cotton). 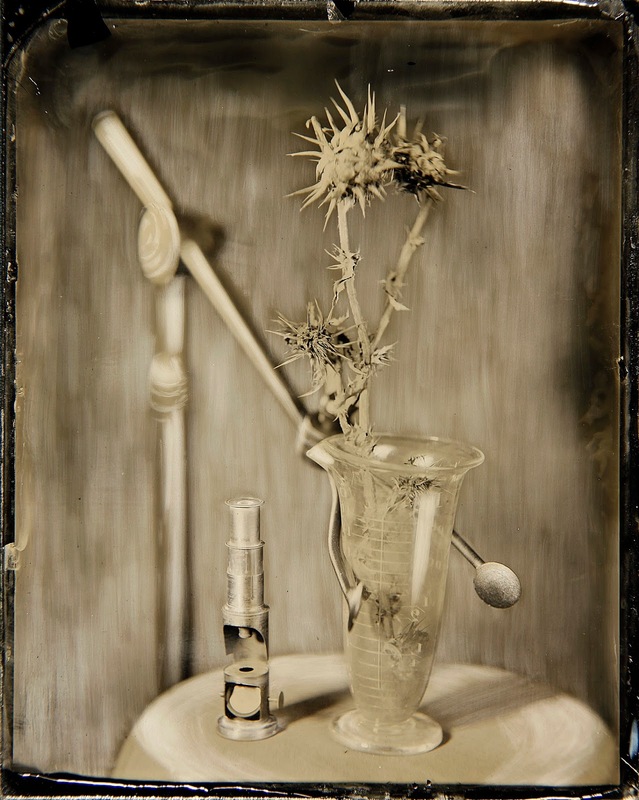 It is the nitrocellulose that acts as a binder and carrier for photo-sensitive salts of silver while making wet collodion images. Vast majority of time, when people say they mix collodion from scratch, they buy USP Collodion premixed and then add various bromides and iodides. More ether and alcohol also need to be added in order to reduce concentration of nitrocellulose from 4%, which is the USP standard, to about 2% in most modern collodion formulas. However, during 19th century nitrated collodion could be purchased a lot more readily than today (it is highly flammable) so all of the old formulas assume you have it and just give measurements based on adding in raw gnu cotton. 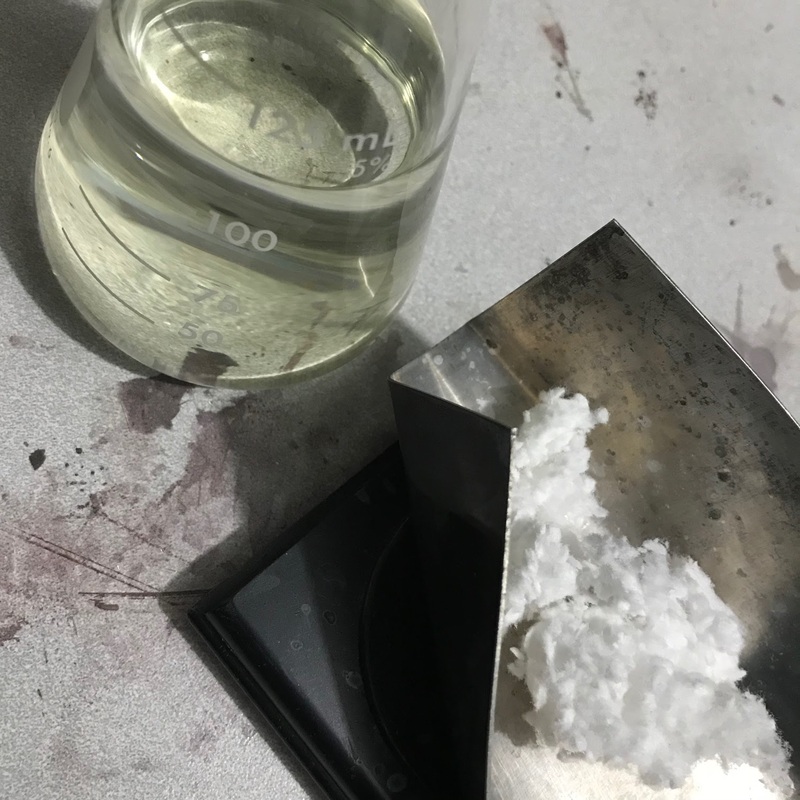 Not long ago I managed to procure a small quantity of raw nitrocellulose and was super excited to try it. I dug through a couple of historic texts and settled on a first formula given in the 1880 publication The Ferrotype And How To Make It. I also got more salts than needed for just that formula so after I'm done with this batch I'll try some others. 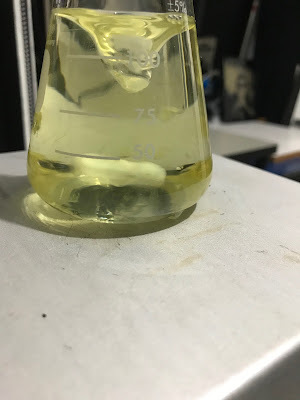 Converting the old grains to grams and anachronistic ounces to sensible milliliters took a minute or two and then I reduced the batch size to about 120ml total so that I could go though it in a timely manner and try something else. Here's the formula I used. Note that nitrocellulose concentration there only came out to be 1.3%. I added ether to alcohol first, then the salts and then gun cotton. As you're adding nitrocellulose constant stirring is required. I forgot about that part and ended up with a gelatinous mass at the bottom of the flask that was sticky and semi-transparent. Luckily I have a magnetic stirrer and so after helping the goo unstick from the bottom I just left it on there for 20min or so and however unwillingly the cotton eventually did dissolve. In the book it says that it's ready to use 'as soon as it has settles sufficiently clear'. Well, when I did it it never clouded up, so it might have been good to go as soon as everything dissolved. My friend Race though stopped by and we went out for coffee while letting the mixture rest and mature a bit. After 2 hours I decided to give it a try and set up a quick still life of things found around the studio. Race stayed on to watch the experiment and to record it. Here's a masterful shot by Race of yours truly pouring the first plate. To my elation the image came out rather well, though a bit overexposed and on the flatter side of contrast, but that's explainable since fresh collodion always tends to be overly reactive and flat. Here it is being washed after development. And here it is after fixing, still wet. 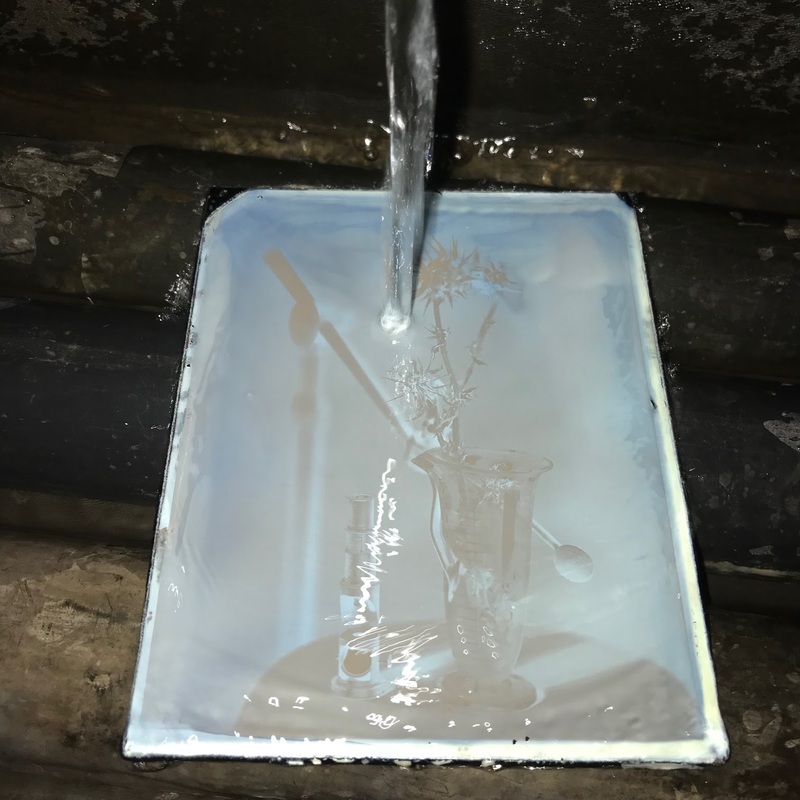 Note in the above image that on top left there's a black torn corner that wasn't present there in the photo of the plate being washed after development. In that corner collodion layer lifted off the glass just a bit and was very fragile, so the action of water rushing over it while washing off the fixer put a tear in there. 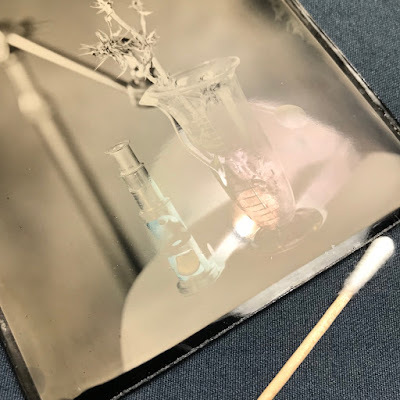 Normally I don't see any lifting of collodion on my glass and this time I did nothing different in glass preparation, so I have to write this one off onto collodion. 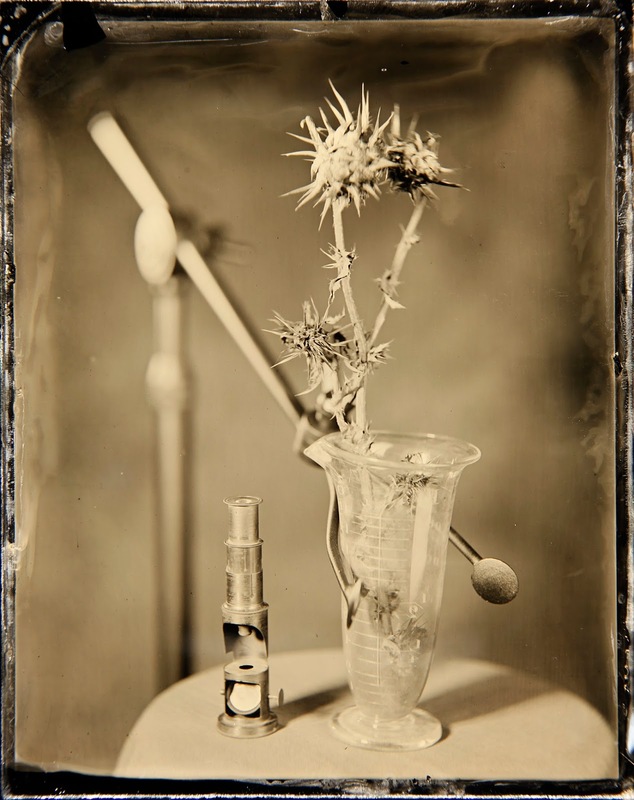 I also have to note that this collodion seems to be on the thin side (perhaps it would be best to step up gun cotton concentration to 2%..?) and while wiping off some minor fog on the plate I did hours later and doing it in my usual manner with a wet loose cotton ball I did put a tiny tear into the emulsion, something that again almost never happens to me. 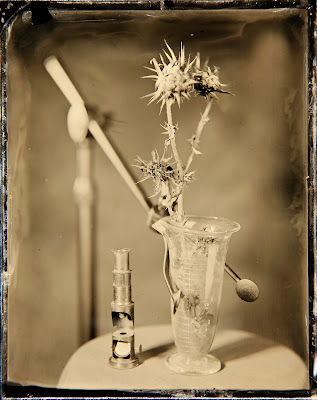 So yeah, this collodion might be a little more fragile than I'm used to, but I think I can easily get used to that. 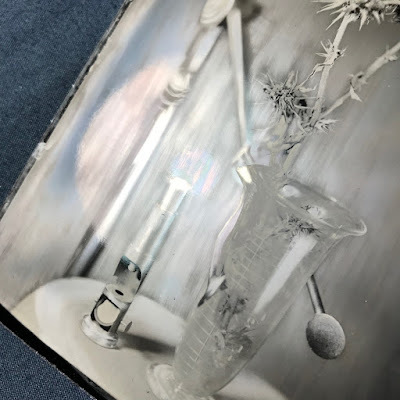 I keep saying this, but I'll repeat it again - viewing alternative or even regular gelatin silver prints or plates on a computer screen is nearly pointless. 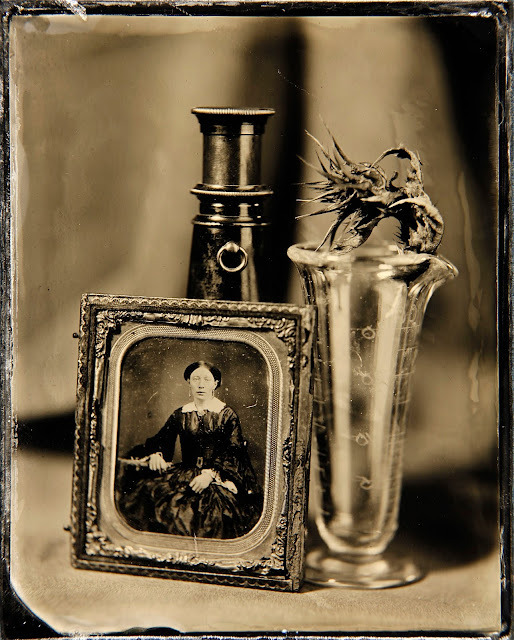 There's no way for the viewer to see the silver playing on the plate or how thick the collodion is... This surface was beautiful - silver was dense with large crystals in highlight and seemed brighter than usual. I couldn't resist and tried burnishing it. Burnishing is a technique where one rubs the plate with something soft, essentially flattening silver crystals and making the image have a very shiny metallic appearance in the areas there it's done. There's no way to fully show it (even videos fall short), but below are similar close-up images of the plate before and after burnishing. Full plate after burnishing is the first image you saw in this post. Note below that along with reflective quality burnishing also changes the tone of the image to a cooler steel grey. I waited another 4 hours and gave it another go with a new still life. By now the color has changed to a slightly deeper yellow and that was a good sign as that's what collodion does as it matures. I did a few plates before I arrived at the one below. First one was still a bit overexposed, but the contrast was a lot better. I turned down the flash power and put in a smaller Waterhouse stop in my Dallmeyer 2B. 2nd plate was there exposure-wise, but I adjusted the composition a bit and so below is plate #3 of that batch done 6 hours after collodion was mixed. Note the 'bright island' spots present along the right side of the above plate and also on the 1st plate above (more visible before burnishing). I have been fighting these spots for a while now and they will deserve a special blog post later. For now I can say that I'm almost certain that it's not exactly dependent on collodion alone and not exactly on the particular bath of silver either, but I think it's the combination of type of collodion and maybe the acidity of the silver... Not sure, but if anyone wants to join the fight agains them I would be glad to join forces over email - drop me a line and I'll describe all I know about them, maybe we can figure it out... In either case, ignore those spots, they aren't collodion's fault. Mixing up collodion from scratch was indeed somehow exciting and satisfying, so now I understand a lot better all the other folks who've been advising me to do so for a while. Now that I've had a taste of mixing it up with pure nitrated cotton I will have to find me some more of that magic fluff or perhaps resort to making it myself as it's really not that hard given proper precautions and equipment. For now I have enough to make maybe 6-7 more small batches, so I'm thinking of trying out a few more mixes and then zeroing in on one and making a few batches of it in a row to really get comfortable. What an amazing odyssey back in time and then forward again! Wow!! !